If you own a MacBook Air or a MacBook Pro then you know there are times when you simply don’t have enough ports. If you travel, with other iThings that problem is worse because you have to carry even more stuff like cables and wall chargers. 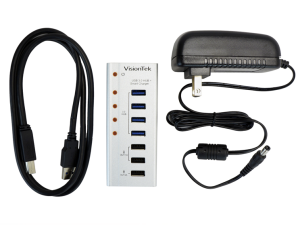 The VisionTek Charge & Sync USB 3.0 Seven Port Hub (hereafter referred to as the “SPH”) succeeds in alleviating the lack of ports on these Macs by providing a hub and sync combination device. This unit provides four USB 3.0 ports (backward compatible with USB 2) that act as a hub and charger (more on the charger function in a moment) and three other ports that are strictly for charging devices. Two of these provide a 1A (1 Amp) output for iPods, iPhones, and other small mobile devices. Finally, there is a single 2A (2 Amp) port that can be used to charge larger devices, like iPads and smartphones that require higher amperage power for charging. There is a row of five LEDs along the left side. One LED is active when the unit is receiving power while the other four are active when something is plugged into the associated port. Plugging into the USB 3.0 port on a mid 2013 MacBook Air allows me to easily utilize the four USB ports on the SPH as a hub. Plugging in USB sticks and a Lexar USB card reader into the SHP results in all of the drives mounting on the MBAir. It is interesting to note that most USB hubs tend to produce lower transfer speeds as opposed to a direct connect USB port on your Mac. Hubs that are powered tend to be faster than non powered hubs. The SHP provided very fast transfer speeds as opposed to other hubs I am using. In fact, transfer speeds were as fast as a direct connect USB 3 port. Plugging in an iPhone 6 Plus and an iPad 2 into the charging ports yielded no results. The devices did not show any charging activity and there was no activity on the devices or the Mac. It was as if I had not plugged anything into the ports. Plugging the iPhone 6 Plus into one of the hub ports did show a charging status on the iPhone 6 Plus. The documentation that came with the SPH states these hub ports will supply 900mA (USB 3) and 500mA (USB 2) charging through these ports. An iPad 2 plugged into the hub ports will display a “Not Charging” message next to the battery icon on the iPad. An interesting note: When you close your MacBook Air, essentially putting the device to sleep, the hub remains connected (LED shows power) and an iPhone 6 Plus plugged into a hub port remains charging. This pass through ability may be helpful when your Mac and iPhone are running low on power. When plugged into an AC outlet the hub functionality of the unit is essentially the same but now the 1A and 2A power ports are functional. Plugging my iPad into the 1A port, or into the 2A port, shows the iPad charging normally. The iPhone 6 Plus also showed a positive charging state from either port. Naturally, the 2A port will charge these devices faster. 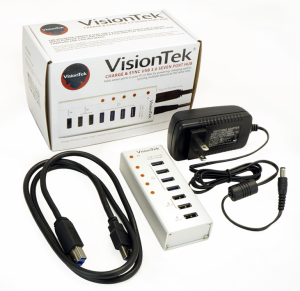 I like the versatility of the VisionTek Charge & Sync USB 3.0 Seven Port Hub. 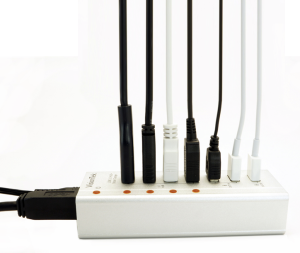 You can charge and connect devices all at the same time with this single unit. I also like the fact that the provided cables are lengthy. What I don’t like is the USB cable itself is pretty beefy. I wonder why it has to be so thick when you consider the thickness of Apple cables? Also, the AC plug is the kind that blocks other plugs on a strip or outlet unless you are lucky enough to have one of those right angle outlets. I like the brushed aluminum finish, but I’d like to see the printing of the port designations on the device in a bold font. They are difficult to read. Another plus: everything you need is in the box. Some hub manufacturers will make the AC adapter an added cost. If you need a hub and charger combination device, the VisionTek Charge & Sync USB 3.0 Seven Port Hub is certainly worth consideration.